Adjust-All HQ is an LTI (Learning Tool Interoperability) external application that integrates tightly with Canvas Learning Management System (LMS) and offers the ability to adjust all course dates and control various settings from one place! Installed in all the courses in your Canvas instance, it’s a dream come true for instructors. Adjust-All HQ picks up all items in your course that have dates and displays them in one page. 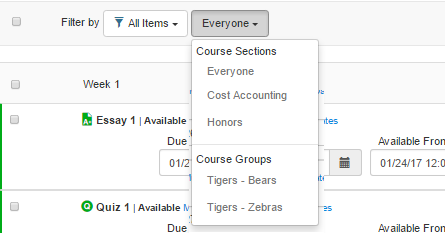 If you have organized your course items into modules, they will be listed by module. Any items that are not associated with any modules are listed below the modules in a section titled “Other Course Items”. Announcements are listed at the bottom. If you have not organized your course items into modules, Adjust-All HQ displays your items by their “Available From” dates. 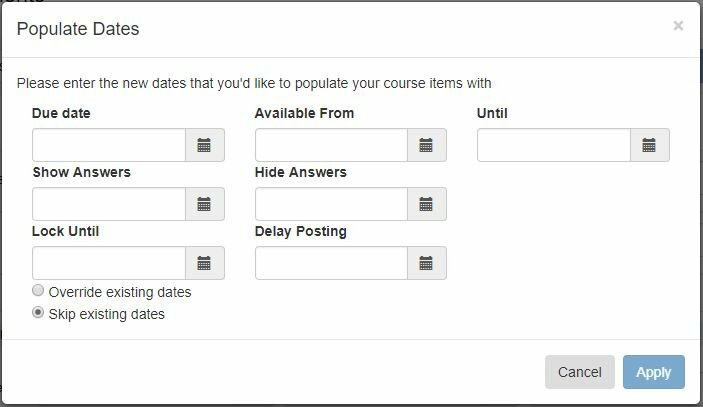 As you may have established unique availability dates for sections or groups in a course, Adjust-All HQ enables you to filter your course items by section or group so that you can make adjustments there. The default lists the dates for ‘everyone’ in the course. To filter by a group or section, use the drop-down menu. To return to the default view, click on “Everyone”. Note: Adjust-All HQ supports the design of Canvas with regard to the tools that support sections and groups. 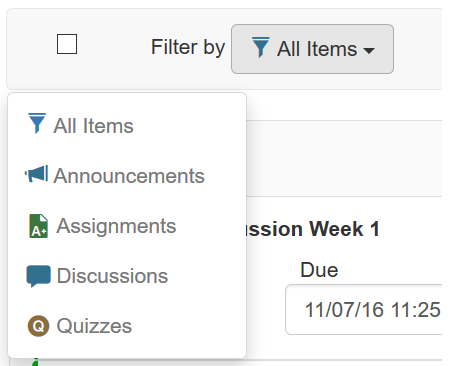 In Canvas, only assignments, discussions and quizzes are section-aware. Assignments and discussions support groups; however, quizzes do not. At a glance, see of your content items, with their settings. Evaluate how the dates relate to each other. Click on the calendar icon to the right of the date field to set or change a date and time. Make changes to your dates and click on Save at the top or bottom of the page. You can shift due dates for a course item forward, including for all sections and groups (i.e. from Monday to Friday), by clicking on the clock icon to the far right of the row. The following pop-up box will appear. Make the changes you want and click on Done. This action will shift the due dates forward only for the items you adjusted. To leave items unchanged, click on Cancel. The following dialog box will appear. You may shift whichever dates you wish (leave blank dates you do not want to change) and click on Apply. Due dates of course items that fell in the ‘from’ dates will be adjusted to your new ‘to’ dates when you apply the operation. Affected items include due dates in the tools that are supported by Adjust-All HQ: Quizzes, assignments, and discussions. 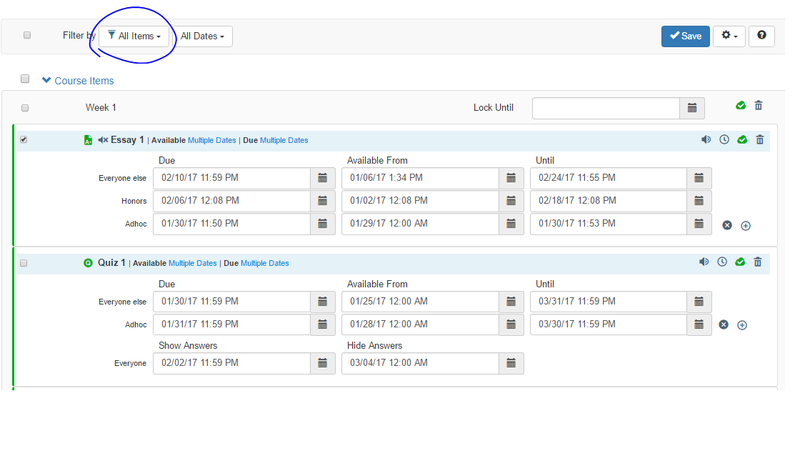 This feature allows instructors to clear all dates in a course at once. This feature is useful if instructors have too many conflicting dates in a course and need to start with a new slate, or they brought content over from another term and didn’t adjust dates upon import. This feature will literally remove all the dates from the course with a single click. The dates that are removed are those included in announcements, modules, quizzes, assignments and discussions. To remove all dates in a course, click on the gear icon at the top right of Adjust-All HQ, and click on “Remove All Dates”. You will be asked to confirm the deletion by clicking on the ‘Delete’ button. Please use this feature with caution, as there is no undo. You may elect to back out of the operation by clicking on ‘Keep’. You can populate ALL dates in a course with new dates at once (i.e. due, available from, until, lock on, etc.) by using a global feature “Populate All Dates”, located under the gear icon at the top right of Adjust-All HQ. In the popup window that appears, enter the dates that you want to populate your course with. 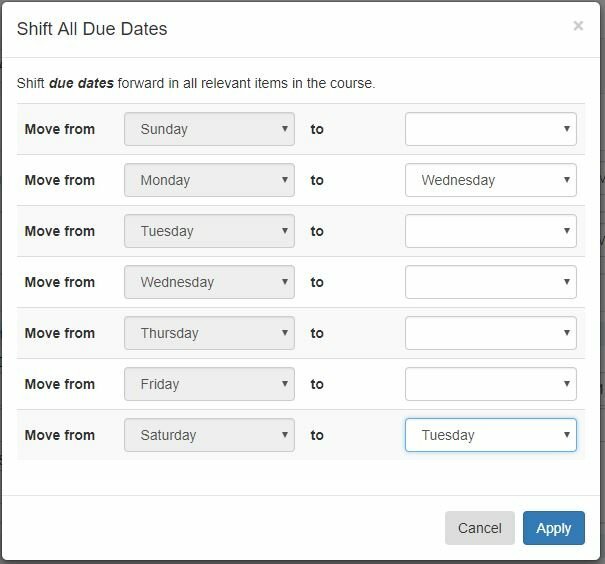 Choose to override all existing dates in your course with new defaults or select to skip existing dates and populate only blank fields with the new dates. Click on Apply. You may back out of the changes by clicking on Cancel. 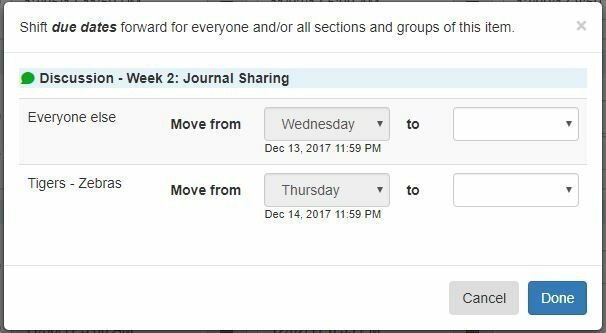 If you want to assign different dates to a group or section in your course, click on the ” + ” icon to the far right and choose the section or group. If you changed your mind, and you no longer want to assign different dates to a section or group, you can click on the ” – ” icon to remove the row. Be sure to click on Save. Filter items by type – assignments, modules, announcements, quizzes or assignments — to make adjustments in a particular area only. For example, if you filter by announcements, you can adjust the delay posting dates of all of them. Note: If an announcement is visible to students, it is shown with a green icon. If it will open in the future (not visible to students), the icon is gray. Click on “All Items” to return to the complete list. Click on the “collapse” icon to view just the module headers and adjust ‘Lock Until’ dates easily. You may select an item, several, or all items and publish or unpublish them at once. To select all the items in the course, click on the checkbox at the very top left of Adjust-All HQ and then click on the gear icon and select the operation you want. No need to save. The function will be applied the moment you click on it. 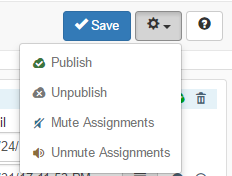 You may also just click on the publish or unpublish icon by each item to toggle its setting, just like it’s done in Canvas. Note: Items that have student submissions cannot be unpublished (a Canvas LMS policy). You may select an item, several or all items and mute or unmute them at once. To select all the items in the course, click on the checkbox at the very top left of Adjust-All HQ and then click on the gear icon and select mute or unmute. To mute or unmute just one item from Adjust-All HQ, you can also click on the gear icon to the far right of a row and select mute or unmute. The operation is completed and saved, without your needing to click on Save. You will receive the standard Canvas confirmation dialog, reminding you what the mute function means for students. The muted icon will be displayed on the left of the item to help you remember that you’ve muted it. Adjust-All HQ allows you to completely delete items from the course from a single, convenient location. To delete an item, simply click on the trash icon to the far right. You will be asked to confirm the deletion of the item from the course. There is no undo. Note: When deleting a module, the items under it do not get deleted from the course; they get listed under “Other Course Items” in Adjust-All HQ. Only the module is deleted from the course. To access the user guide, click on the help icon on the top right of the page (question mark icon).